Free-form wall hanging made from kozo amate (bark paper), some of which had been dyed with a fiber-reactive dye. The method of weaving the wet fibers together and drying induced a permanent curve in the final rigid structure. 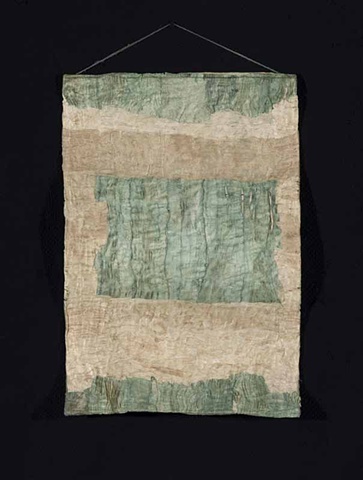 The structure was sewn to a narrow strip of wood, covered with amate, from which the piece hangs on handspun linen thread, dyed to match the green of the paper.